Wednesday Feb 20 @ 7 – 9 pm. Cost $50/person. 21 years or older. Everyone loves tacos! Join us for a fresh take on an old favorite. 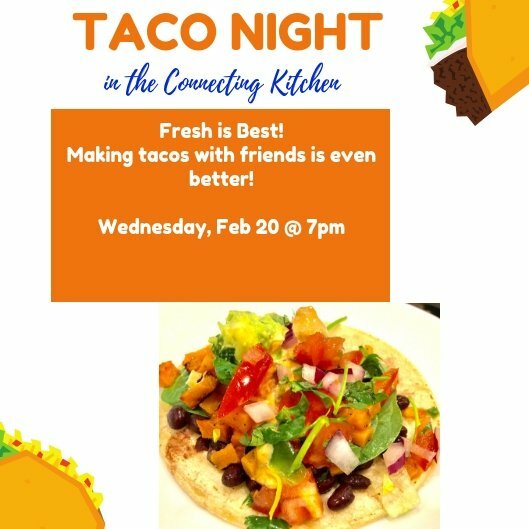 The menu includes Black Bean and Butternut Squash Tacos (vegetarian), and a more traditional Mexican Beef Taco for those of you who never get tired of the original. Tacos are a great way to include lots of fresh whole ingredients and you can always make them how you like it. Last time we did this class, there were so many creative and delicious combinations, I was so impressed. What I love most is these tacos are so easy to make. I hope you can join us! If you’d like to sign up for this class, send us an email and we’ll save you a spot. This class will be held in the Connecting Kitchen in South Charlotte, NC. The class includes a hands on cooking demonstration, tacos, a glass of beer or wine, and of course new friends to connect with. 21 years or older. Friday Feb 22 @ 7 – 9pm. Cost $50/person. 21 years or older. Join us for this hands-on experience as we learn how to make Indian Chicken Curry. Loaded with superfoods and flavor, Indian food is one of my favorite cuisines. Come join the fun as we show you how it’s done. As an added bonus we will be making a creamy Mango Tart for dessert. This class will be held in the Connecting Kitchen in South Charlotte, NC. 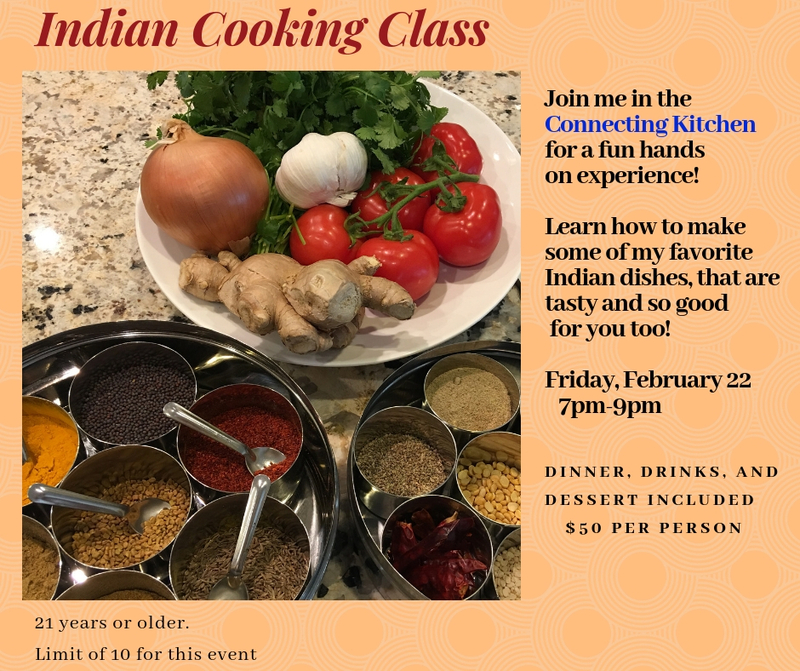 The class includes a hands on cooking demonstration, curry, dessert, and a glass of beer or wine, and of course new friends to connect with. Tuesday March 12 @ 4 – 5:30 pm and Tuesday March 26 @ 4 – 5:30 pm. Cost $30/child per class. Ages 7-11 years old. Join us in the Connecting Kitchen! We will make yummy food, make new friends, and of course, have lots of fun! We use fresh whole foods ingredients and encourage kids to taste a variety of foods. You will be surprised at what they are willing to try when they make it themselves. There are so many lessons to learn in the kitchen. The kids learn communication, respect, patience and how to work together. 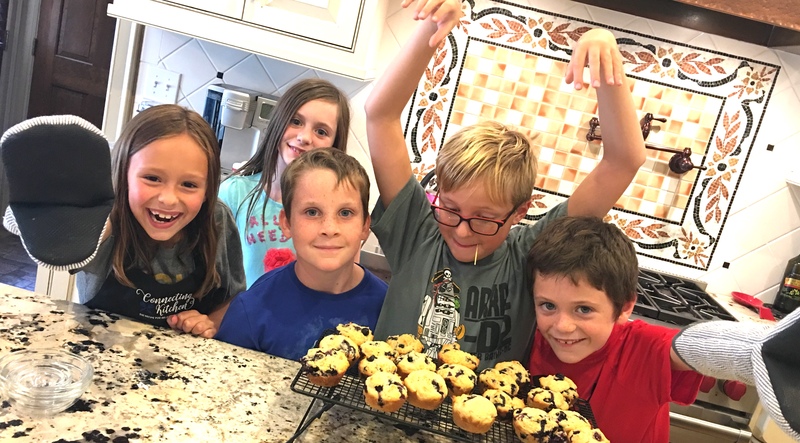 We especially love how cooking builds confidence and self-esteem. Our recipes include things like homemade pizzas, buddha bowls, tacos, pot stickers, zoodles and sauce, homemade granola and yogurt parfaits, Vietnamese summer rolls, açaí bowls, coconut cake, and blueberry muffins to give you some idea. We are always adding new recipes to keep it interesting. This class will be held in the Connecting Kitchen in South Charlotte, NC. Saturday April 6 @ 11 am – 1 pm and Saturday April 27 @ 11 am – 1 pm. Cost $30/student per class. Ages 12 – 15. Join us in the Connecting Kitchen! 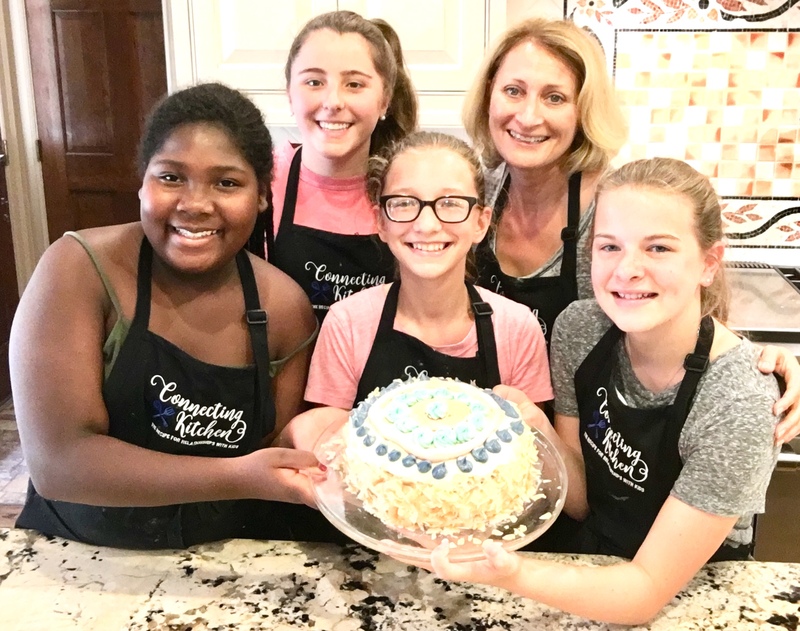 This class is designed to teach tweens and teens the importance of cooking, eating well, and how to have fun in the kitchen. We will make delicious recipes that they can then make at home. Vegetarian options are always available. We use fresh whole foods ingredients and encourage all students to taste a variety of foods. You will be surprised at what they are willing to eat when they make it themselves! I hope your tween or teen can join us! If you’d like to sign up for this class, send us an email and we’ll save you a spot.